Combine these ingredients in a Nesco and cook for 2 hours on medium heat. Once sauce has thickened, add to beans and cool on low for an additional 8 hours. Stir GENTLY once every hour. Enjoy! After a bit of research and creativity, we've come up with a delicious, fool-proof recipe for some amazing granola! The texture is super crisp and crunchy, with a sweet maple flavor. Note: the granola may still seem sticky after 1 1/2 hours in the oven-once it cools, it will harden and get crunchy. Mix 1/4 cup maple syrup and 1 tablespoon of soy sauce. Pour liquid into an 8 inch by 8 inch baking dish (glass works best). For salmon, put the fish flesh side down in the pan and leave in the refrigerator for 20 minutes to an hour. Turn the fish over so the flesh side is up and cook in an oven preheated to 400 degrees F for 20 minutes. Do not cover the dish. For tilapia, place fillets in the maple/soy marinade and let sit in the refrigerator for 20 minutes. Turn fillets over and marinade in the frig another 20 minutes. Then cook as for salmon, 20 minutes at 400 degrees F, uncovered. In both cases, 1 to 1.25 lbs of unfrozen fish works best. This is a delicious recipe. The only problem is, when we cook fish this way we don’t end up with any leftovers! The sun finally came out today and it warmed up to +40 degrees! It felt so spring-y! Hopefully, the warmer temperatures and the sun will melt some of this snow so we ca get into the woods to tap trees! Melted snow=more water for the trees=more sap=more syrup=more deliciousness=happy customers! Sending a warm day to you and yours, the Davis Family! 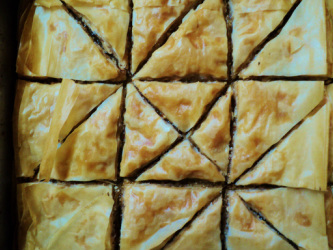 I've finally come up with a good recipe for the baklava! I made it a second time, and it didn't turn out quite as good as the first, but I can remember what I did better the first time. To start out, I chopped about a cup of salted roasted almonds and mixed them with a half of a cup of brown sugar. We've got vanilla beans packed in sugar, so I chopped about a fourth of a bean really finely, and added that to the nut mixture along with some of the sugar from the beans. Once I got that all mixed together in a bowl, I set it aside and got a stick of butter melted and ready to brush over my pan and phyllo dough. I got the pan buttered and started layering the dough. It's nearly the perfect size for a 9x13'' pan, so I cut them in half and layered them with butter in between. After about 12-15 layers, I started sprinkling the nut mixture, and once it ran out, I finished the pan off with 12-15 more layers, brushed with butter, cut it into triangles and popped it in the oven at 350 for about 40-45 minutes. Once it was nice and crispy and golden, I poured the syrupy mixture over the top, set it back in the warm but turned off oven, and left it until it was cool and ready to eat. It was delicious, warm, nutty, buttery, and flaky! The recipe is below, so enjoy! 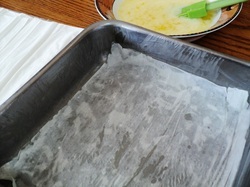 Melt butter and brush an 8x8'' pan with the butter. Start to layer the phyllo dough, brushing each layer with butter. 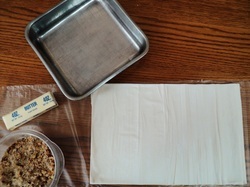 Once 12-15 layers are built up, sprinkle the nut mixture over the dough, and continue layering until the nut mixture is gone. Add 12-15 more phyllo layers, adding butter in between each. Once it's finished cut the pan 3x3 and cut each square diagonally. Bake at 350 for 40-45 minutes. Add syrup and water to a small saucepan and simmer for 5-7 minutes. Place vanilla bean in a small tea bag coffee filter-something that can be sealed to prevent the vanilla bean from getting into the syrup. Add bag to the syrup mixture along with butter flavoring and let sit/cool until baklava is done. Pour the cooled syrup over the hot baklava. Turn the oven off, leave the door open, and keep the baklava in the oven for a few hours until it's ready to eat. 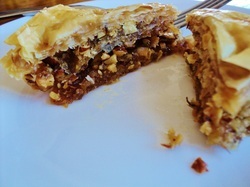 So if you haven't had traditional baklava before, you should definitely try it! It's originally of Assyrian origin, but is typically considered Greek or Lebanese, and it's flaky and nutty and syrup and delish. Anyway, this is NOT traditional baklava. Of course, it's made with maple syrup. And, it's way better. Unfortunately, I didn't keep track of what I did, nor did I measure anything. Luckily, I had a general idea, and since everyone loved it so much, I can make another pan and keep track! Hopefully I can update with a recipe soon!